The yield curve is flattening (or growing steeper)! … Yield curve spreads are widening (or narrowing)! … The yield curve has inverted (or normalized)! Headline-grabbing yield curve commentary somehow sounds important, doesn’t it? But what exactly is a yield curve, and what does it have to do with your investments? Yield curves typically depict the various yields across the range of maturities for a particular bond class. For example, Figure 1 would tell us that a U.S. Treasury bond with a 5-year maturity yields 2.4% each year, while a 30-year Treasury bond yields 3.4%. For illustration only; actual numbers may vary. Bond class – Analysts typically define a bond class or type by its credit quality. Backed by the U.S.government, analysts often use U.S. Treasury yield curves as a reference. Analysts often compare other bond types (such as municipal bonds, corporate bonds, or other government instruments) to US Treasury Bonds. Term/Maturity – The data points along the bottom X axis of a yield curve represent various terms available for a bond class. The term is the time you’d need to hold a bond before your loan matures and you should receive your initial investment back. Yield – The data points along the vertical Y axis represent the interest rate, or yield to maturity currently offered– such as 2% a year, 3% a year, and soon. The yield curve for any given bond class changes every time its yields change … which can be often. Spread – The spread is the difference between the annual yields on two bond maturities. So, in Figure 1, there’s a 1% spread between 5-year (2.4%) and 30-year (3.4%) Treasury bond yields. Next, let’s look at the curve itself – i.e., the line that connects the data points just discussed. The shape of the yield curve helps us see the relationship between various term/yield combinations available for any given bond class at any given point in time. Just as our body temperature is optimal around 98.6°F (37°C), there’s a preferred equilibrium between bond market terms and yields. 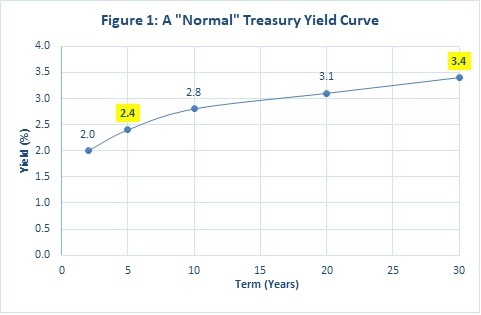 “Normal” occurs when short-term bonds are yielding less than their longer-term counterparts. Under normal economic conditions, investors added compensation with a term premium for the risk of owning longer maturities. They’re accepting more uncertainty about how current prices will compare to future possibilities. Conversely, they’ll accept lower rates for shorter-term instruments, offering greater certainty. At the same time, evidence suggests there’s often a law of diminishing returns at play. Typically, the further out you go on the yield curve, the less extra yield is available. 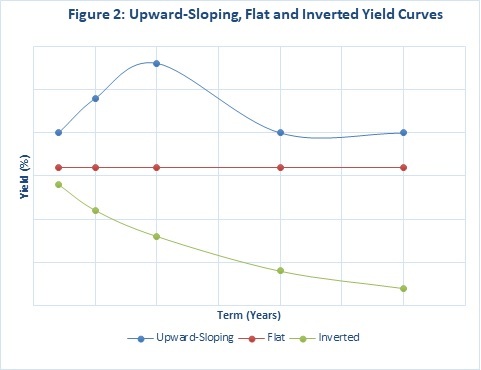 Thus, Figure 1 depicts a relatively normal yield curve, with a bigger jump to higher returns early in the curve (a steeper spread) and a more gradual ascent (narrower spread) as you move outward in time. If Figure 1 depicts a normal yield curve, what happens when things aren’t so normal, which is so often the case in our fast-moving markets? The shape of the yield curve essentially reflects evolving investor sentiments about unfolding economic conditions. In short, expectations theory suggests the yield curve reflects investor expectations of future interest rates at any given time. Thus, if investors in total expect rates to rise (fall), the yield curve will slope upward (downward). If they expect rates to remain unchanged, it will be flat. Figure 2 depicts three different curve shapes that can result. For illustration only; actual curve shapes may vary. It’s rare for the yield curve to invert, with long-term yields dropping lower than short-term. But it happens. This typically is the result of the Federal Reserve (or another country’s central bank) tightening monetary policy, i.e., driving up short-term rates to fight inflation. Recessions often follow an inverted yield curve – although not always, and not always universally. Does this mean you should head for the hills if the yield curve inverts or takes on other “abnormal” shapes? Probably not. At least not in reaction to this single economic indicator. The yield curve is an important tool for determining how to efficiently execute this greater goal. It helps explain why we typically recommend holding only high-quality bonds, minimizing call risk, and usually striking a balanced middle ground between short-term versus long-term bonds. 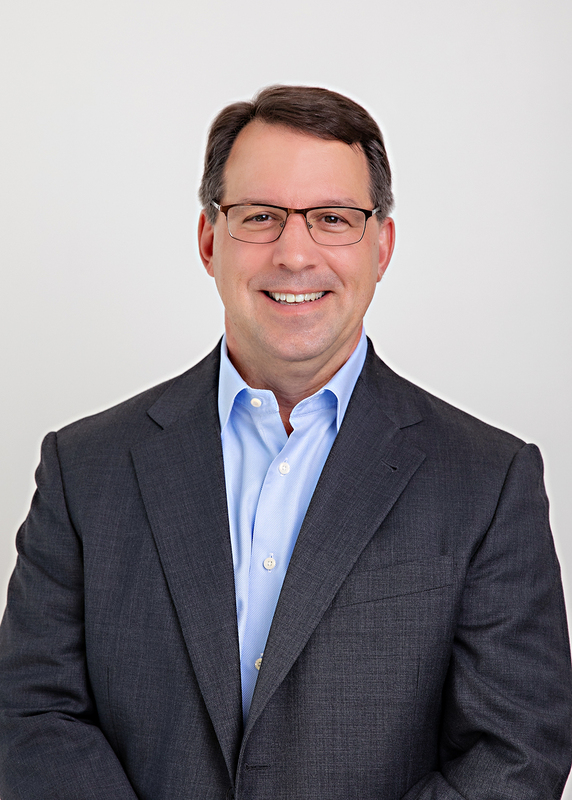 Similar principles apply, whether investing directly in individual bonds or via bond funds. 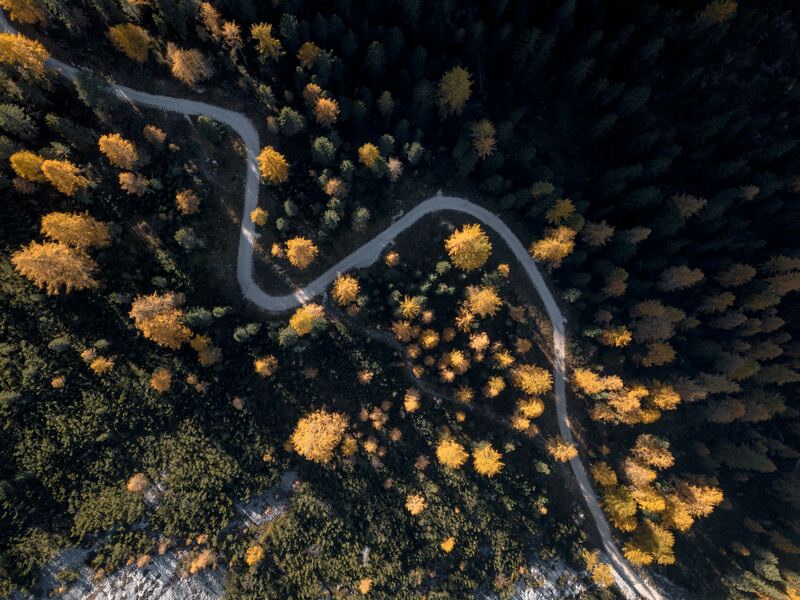 In short, it’s fine to consider the yield curve, but it’s best to look past it to the distant horizon as you invest toward your steadfast financial goals. We hope you’ll be in touch if we can tell you more about how fixed income/bond investing best fits into that greater context.